It seems that Christmas is almost here and you can tell by how many more cookies we are baking! I couldn’t wait to make these gluten-free pizzelle!! 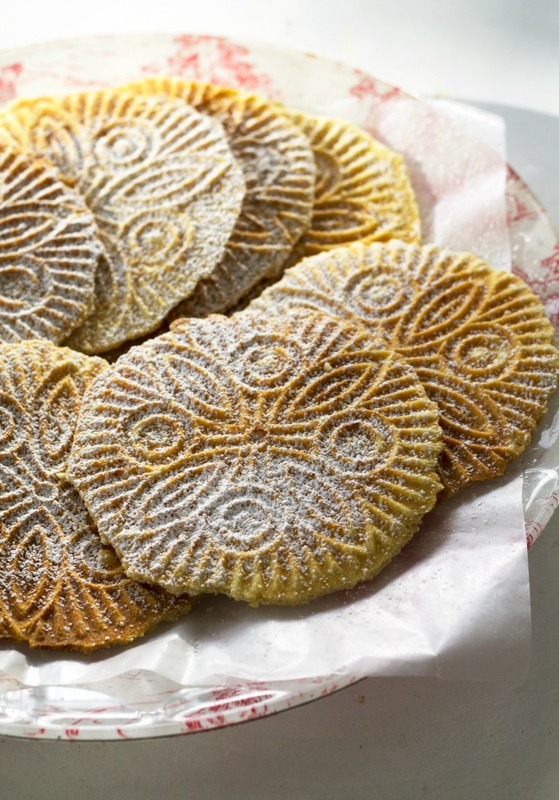 Pizzelle are cookies that remind me of so many Christmas celebrations growing up. You won’t find pizzelle just anywhere in Italy. My in-laws are here visiting from Italy, and they have never seen them before. They may also be called ferratelle and they can find in the Molise and Abruzzo regions of Italy. In Abruzzo, they may also be called neole, nevole or cancelle. 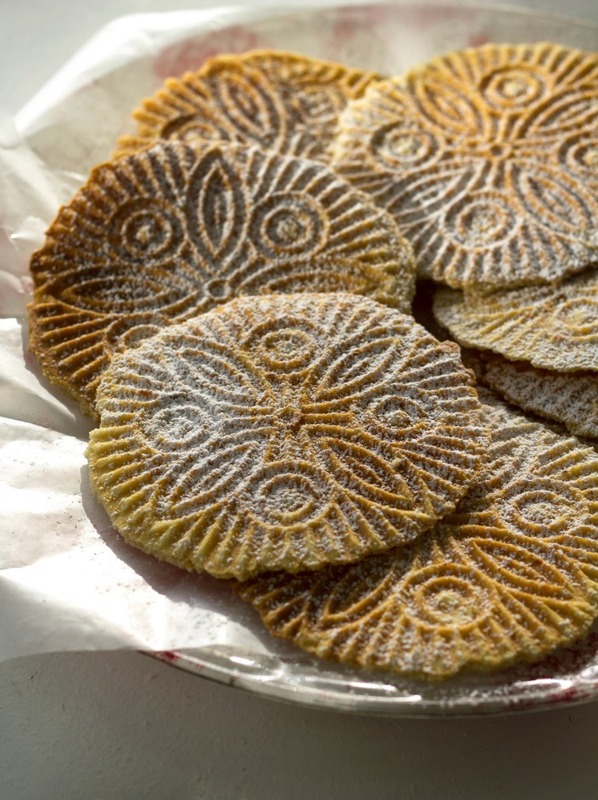 The first pizzelle were made in Abruzzo back in the 8th century. The irons used to make the pizzelle were round or rectangular and very often had the family crest on them. Today you can find them made in the shape of a heart, a snowflake or even a flower (depending on the cookie maker). My dough was like a thick pancake batter and you spoon out enough to add to the center of the iron (just about a tablespoon). You make two at a time and you have to carefully lift them off of the iron. If it runs over the design, you just have to break around the edges to take off the excess cookie. While they are still hot, you could even roll them into a cannoli shape or even a cone to hold gelato. They are also fun topped with custard, jam or Nutella!! There are only 5 ingredients to make the pizzelle-eggs, sugar, flour, baking powder, and a fat source (I used melted butter). I made these with gluten-free flour. You could use your favorite all-purpose flour instead if you aren’t baking gluten-free. The texture will depend on the quantity of the ingredients and also the amount of butter (or oil). The flavor is entirely up to you! I like to add anisette and vanilla. I use probably less anisette (I know some recipes use one tablespoon of anisette)than other Italian bakers, as my kids prefer the taste of vanilla. 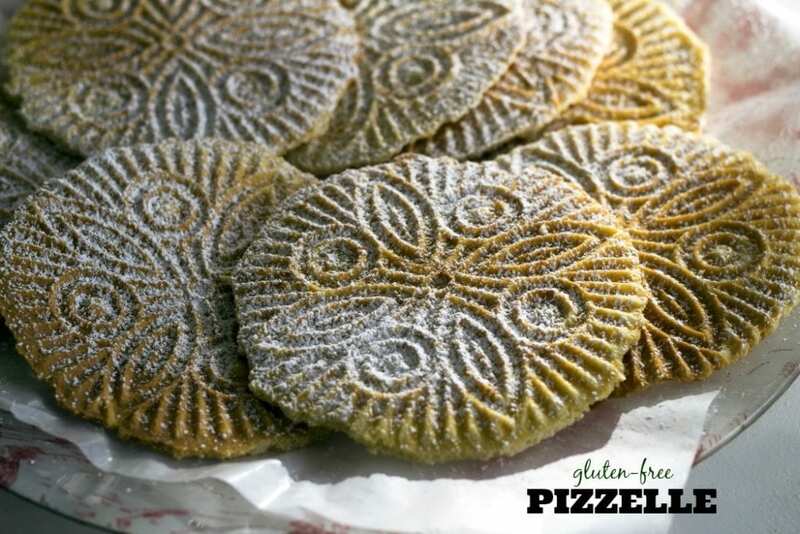 The pizzelle are thin and crisp and very delicate. When you remove the pizzelle from the iron plate you have only a few moments to roll into a different shape before they dry. Or you lay them flat like we did and dust with confectioner’s sugar to enjoy them as simple and delicious as they are! The pizzelle can be stored in air tight container for up to two weeks (at least in Florida…maybe longer in a colder kitchen). 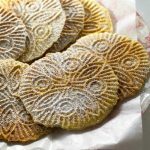 Thin, delicate and crispy pizzelle cookies from the Abruzzo region of Italy are lovely to bake during Christmas or any time of the year. Perfect to enjoy with an espresso for a coffee break. Warm up a pizzelle iron and spray lightly with cooking spray. In a large mixing bowl or the bowl of an electric mixer fitted with the whisk attachment, beat the eggs and sugar until frothy and beginning to thicken (about 2-3 minutes). On low speed, add the extracts and melted butter to egg mixture in a steady stream and mix for 30 seconds. Slowly add the dry mixture to wet and blend just until combined. Your batter will resemble a soft and sticky dough. Drop 1 tablespoon of batter on hot pizzelle press. Close press and cook for about 1 minute or until light indicated cookies are done (cookies should be slightly golden). Use a fork to lift pizzelle off the press and transfer to a plate. These are the prettiest pizzelle I've ever seen, Lora! Beautiful! LOVE that they're GF! I love pizzelles, and yours looks so pretty! Pizelles are such a classic for the holidays! 🙂 These look perfect. Hooray for making over classics to be gluten-free! I love Pizzelle cookies! I can find them in some of the stores here but it's rare! Love that I can make them at home now! Those are so pretty and I love all the background info! I make these with my mother in law every year! We love them in our family!